How many dog training treats per day maximum? What’s better: dog training with treats or praise? How to use puppy training treats at a young age? How should I store dog training treats so they stay fresh longer? Are dog treats for clicker training any different? Dog training treats, what? Treats are treats, no? Well, not really… The best dog training treats are designed to be low calorie, very palatable, and small enough to be given many times every day. Owning a dog regardless of its age requires constant training and thus far, positive reinforcement is the best dog training method. Its principals are simple to grasp: reward desired behaviors (with treats and praises), and completely ignore undesired behaviors. Such training, especially at a young age, requires a lot of puppy training treats to be handed over every few minutes. Yet, as a responsible dog owner, the last thing you want is to overfeed your dog. Welcome to the world of dog and puppy training treats! Very tasty bits that are easy to hand over, convenient to store, and loved by all dogs around the world. Now, there are so many of them available that you’ve got to pick the best training treats for your dog or puppy. Here are a few frequently asked questions about puppy training treats, and their answers. Right after the below FAQ, you will find our top 10 best dog training treats reviewed for you so you can make an informed decision today! Because the offering is huge online and in pet stores, people tend to freak out and end up picking the cheapest of all. 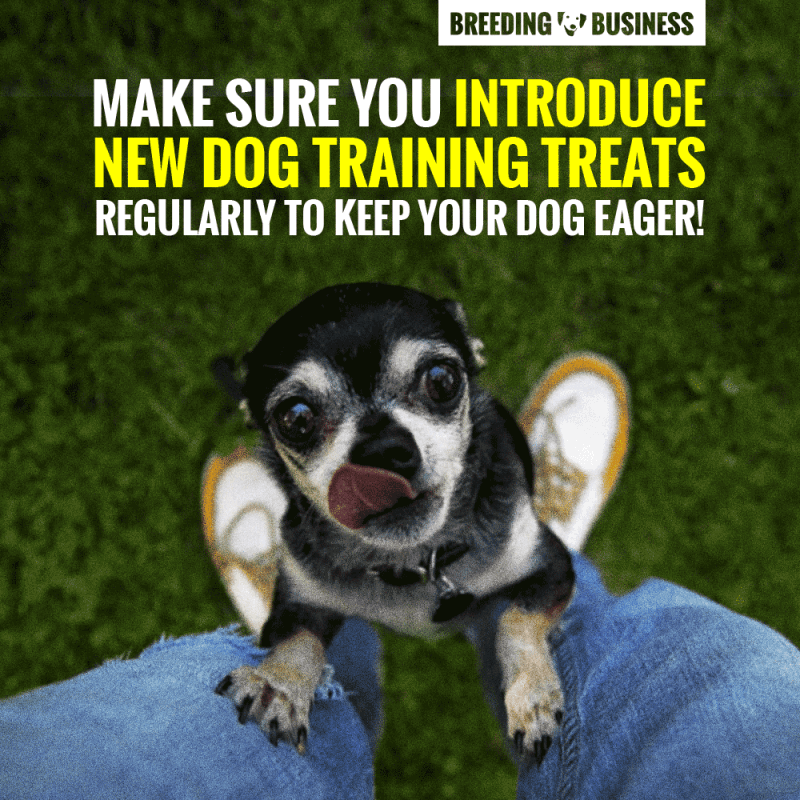 Seeing that dog training treats are given so many times every day, you do want to pick a healthy product that is small or can be broken down into plenty of small pieces. There is no maximum but you must ensure that you factor in the number of treats given to your dog in your dog’s meals for the day. If you do a lot of training on weekends, reduce the overall meal portions so it remains balanced. If you are training your dog a lot every day, you do want to invest in protein-rich puppy training treats rather than carb-filled ones. This is to mimic and improve your dog’s overall diet. Liver dog treats are great for intensely trained dogs. A very common question when somebody enters the world of training dogs: should I base my training rewards on praises or treats? It depends. Some dogs seek more attention and cuddles than they seek food rewards. 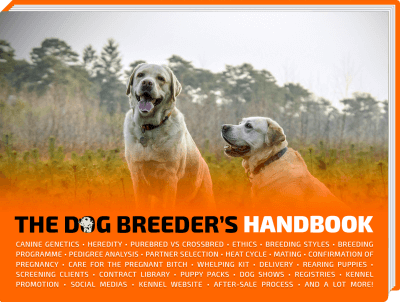 Get to know your dog and find out what makes your pooch do anything for you and stick to it. Never overdo it and shuffle things up at times just so you don’t become dependant on treats. Indeed, you don’t want your dog to completely ignore you the days you haven’t got any training treats on you, do you? Another common issue faced by new dog trainers and owners is that they do not try enough types of training treats for their dogs. Try to introduce new flavors regularly, especially during the first few months of training. It is not because a particular brand of treats works that another one is not going to work even better. Dogs are generally easy to please with food so it is your duty to find what works well, and then find training treats that will work even better. Puppies should undergo several hours of training every day during their first months of age. They will consequently receive a larger amount of treats so the quality of the treats matters a lot more than for adults. Proportionally, puppy training treats will represent a bigger percentage of your pup’s daily calorie intake. Prefer single-animal sources and higher levels of proteins over cheap carb-based training treats for puppies. They may be slightly pricier but by not much, especially when bought in bulk. Simply use a small dog food container and when you take some out for a training session with your dog, put them in a quality dog training pouch. Dog training biscuits and treats are dry products so they should not spoil very easily, they are produced to remain fresh for a long time. Therefore, there is no rule in what constitutes a clicker training dog treats. They should simply be tasty and loved by your dog — if he or she doesn’t crave them, they won’t be receptive enough to your clicker! Meat-based dog training treats or even diced up cheddar generally work wonders for clicker training. Try new dog training treats often to keep your dog enticed: new shapes, new brands, new flavors, new sizes, there are a lot of great training treats out there! So many treats for training dogs are available that it makes many dog owners give up. We are here to help you out in your search of the absolute best dog and puppy training treats available right now. We have spent hours (and days) compiling the data available, the products we have personally tested, reviews from many other websites, just to shortlist these top 10 best dog training treats. Puppies cannot chew very hard treats and the world-famous BLUE brand understood it. With these soft puppy training treats, young pups can easily enjoy them without having to chew for long. The first ingredient is beef, and there are absolutely no chicken by-products or poultry meal, as well as no corn, wheat, and soy. One single treat has 3.5kcal which is most definitely amazing if you are giving out plenty every day. If your dog likes change, there are three other flavors available: beef and venison, chicken and lamb, and turkey. Each pouch has 4oz (or 113g) so you can buy them in bulk thanks to their inexpensive price tag, especially for the quality of the product. Remember than these healthy training treats for pups and adults are made in the United States with fine ingredients. This dog training jerky is protein-rich and will benefit dogs of all ages, whether they are active or sedentary, on a strict diet or not. Dogs with sensitive stomachs or prone to food allergies follow a diet that removes ingredients commonly causing gastrointestinal troubles in other dogs. Most dogs do not need to follow such diet but the few that do, have to. Natural Balance has developed training treats for dogs with sensitive stomachs. These training treats support the dog’s digestive health and have limited ingredients specially formulated together to avoid any digestive issues. Such quality ingredients include chicken, sweet potatoes, canola oil and rosemary extract amongst many others. 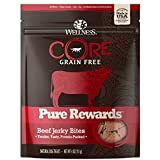 The bad side of these treats is their low protein content but most dogs with sensitive stomachs have a hard time digesting proteins so it all makes sense but these wouldn’t be great candidates for a regular healthy dog. Buying dog training treats in bulk is a great idea simply because we tend to distribute them in big amounts, every day. Therefore, buying them small pouch by small pouch, month after month, is a cost-inefficient way of proceeding. Now, marketers and brands have convinced us to use ‘bits’ as dog treats but I dare to contradict them and recommend you to simply buy high-quality and protein-rich kibble instead. It comes in much bigger bags so it is de facto cheaper per pound. Since you are not going to serve this kibble three bowls a day, it will last you for several months — so it’s worth buying the best you can afford! Wilderness Blue Buffalo is fortified is many important nutrients and active compounds such as glucosamine, omega 3 and 6 fatty acids, taurine, chelated minerals, calcium, and phosphorus. If you could afford it, it would be the best dry dog food for most puppies and adult dogs! It’s over 30% of proteins and less than 15% of fat! 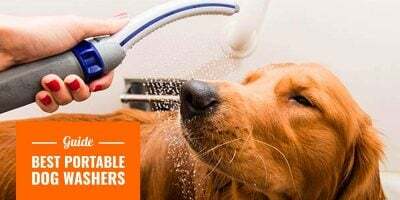 Rocco & Roxie has become a very popular brand name for dog owners thanks to their variety of quality pet products from grooming supplies to premium dog treats. And they’ve done it again: a healthier and more natural alternative to other mediocre treats for dog training. 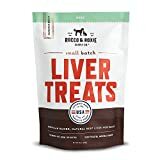 These all-natural liver dog treats are chunky so you would need to cut them into small bits. To enhance their palatability, these liver jerkies are slow smoked and do not have other ingredients added. It’s simple, it’s healthy, and it’s loved by all dogs! Forget about artificial preservatives and conservators, Rocco & Roxie liver treats for dogs can be left in their own foiled-lined resealable bag to keep them fresh for longer. If you are after organic dog training treats, check out the Plato Smart Dog Treats which are made with organic chicken. 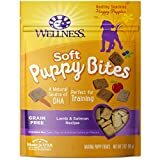 One of the bestselling puppy training treats currently available, the Wellness Puppy Bites are delicious chewy bits made with lamb and salmon. They are totally grain-free and contain a high level of proteins and much-needed complex carbohydrates. Proteins and essential amino acids are sourced from quality lamb and premium salmon. The healthy carbohydrates come from nutritious fruits such as blueberries and apple, but also chickpeas, sweet potatoes, and carrots! Fatty acids such as omega 3 and 6 are present thanks to flaxseed and salmon mainly! Thanks to its superfoods, DHA, vegetables, lamb, and salmon, Wellness Puppy Bites is making everybody forget about grains. It’s a success and the price is actually great for such a high-quality product! 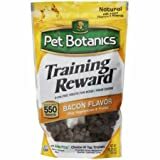 To my knowledge, these are the most popular dog training treats — it does not mean they are the best, it simply means they are cost-effective and not bad! You can get a pound (just about 450g) for roughly ten dollars: this is a great value! Looking at the ingredients list, things do not look too bad actually: chicken comes first, rice and barley follow so there is clearly a big amount of low-quality carbohydrates. Proteins, on the other hand, are declared as being at least 10% of the entire content, which is really not much. These would be great training treats for punctual use but not as daily rewards. 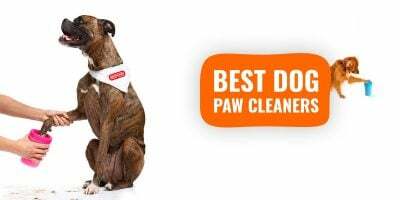 You should seek a healthier alternative from our top list if you want the best for your dog. However, used a few times a week, these are perfect in terms of price and nutritional values! Dog training treats are generally very small so their calorie count is very low, commonly below 5 kcal per treat. These training rewards from Pet Botanics are pushing the calorie count even lower with 3 kcal per treat. They are the perfect low-fat and low-cal training treats for overweight dogs. 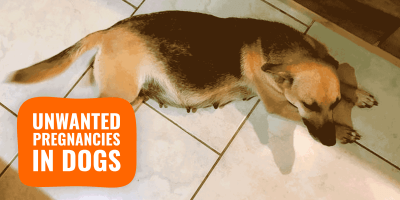 Even with such lean dog treats, the list of ingredients matter. We’ve got pork liver as the main ingredient which is really really good and shows that they put quality first. On the bad side, there are a lot of them in this list — over 35 ingredients the last time I counted! It does not make much sense for such a simple product even if there are good ones in the list such as various berries and sweet potatoes amongst all. Do we recommend it? Yes, totally! It has over 1,300 feedbacks and a 4.5-star rating right now on a famous marketplace. 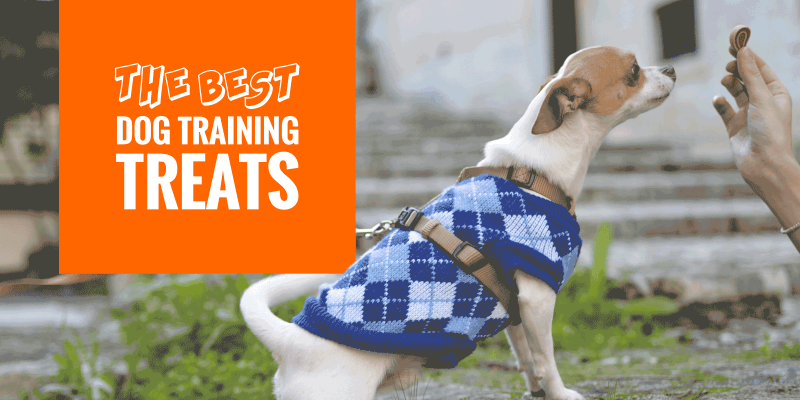 Thousands of people use these exact training treats daily and everything seems fine for them! Similar to puppies, small and toy breeds of dogs tend to struggle with regular-sized training treats or biscuits. Training treats for small dogs must be soft, chewy and tiny. 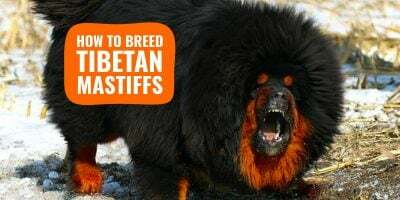 This is the only way for them to be able to enjoy them swiftly so the training can carry on without too much of a break for them to break down their reward. 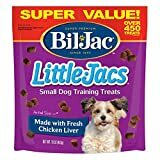 Bil-Jac has produced perhaps the absolute best small dog training treats with these Little-Jacs. They are packed with over 25% of proteins, a balanced 10% of fat, and no more than 2% of fiber content. There is no gluten meals or added rendered fat. Quality is key here since the three first ingredients are chicken liver (very good! ), chicken (nice!) and chicken meal (decent.) This is not gourmet dog treat but it’s definitely recommended for daily use and it’s perfectly shaped for small mouths and digestive tracts. Most training treats are somewhat small and do not really suit large or giant dog breeds: they just do not feel them and can barely feel their taste. Not that appealing for what’s meant to be an enticing reward! Instead, larger dogs should be rewarded using biscuit-sized training treats. However, most regular-sized treats are full of wheat, grains, and low-quality carbohydrates. 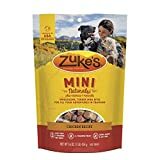 These Smokehouse Beef Munchies For Dogs are literally ideal for large dogs: they are made from beef and only feed, nothing else. It’s 100% beef lungs which are very tasty for our dogs (thank the Lord cows do not smoke cigarettes, ha!) And this is the only ingredient on the list. The beef jerkies have been slowly roasted and air-dried in order to reach the optimum texture and consistency. They can be stored for a long time because of their very low water content and their palatability is that of beef, so rather hard to beat. For training purposes, I would recommend you to cut them in smaller bits upon reception of the package. That way you aren’t giving away too much to your dog and can make one bag last longer. These are made in the United States so do not worry about manufacturing and hygiene standards!